Currently on view at the Museum of Contemporary Art in Hiroshima, Japan, is an arresting set of works by Colombian artist Doris Salcedo (b. 1958, Bogotá, Colombia), who is the recipient of the 9th Hiroshima Art Prize. Established by the City of Hiroshima in 1989, the prize underscores the “achievements of artists who have contributed to the peace of humanity in the field of contemporary art, and through contemporary art aims to appeal to a wider world and the spread the ‘Spirit of Hiroshima,’ which seeks everlasting world peace.” The site of the detonation of the first atomic weapon ever to be used against a human population, the city has a sordid history, and its monuments commemorating the over 100,000 dead (over 60,000 died instantly in the blast) holds a special value to any and all who seek peace among the myriad peoples of the planet Earth. This significant prize is awarded once every three years, and the exhibition will be on view until October 13, 2014. Salcedo’s work explores the potential power of art as a form of resistance, against the threat and exercise of violence, and the rampant discrimination against the powerless in her native country of Colombia. These conditions plague Latin America and many other parts of the world, and her artworks act as commemorative monuments to those who have been victimized. 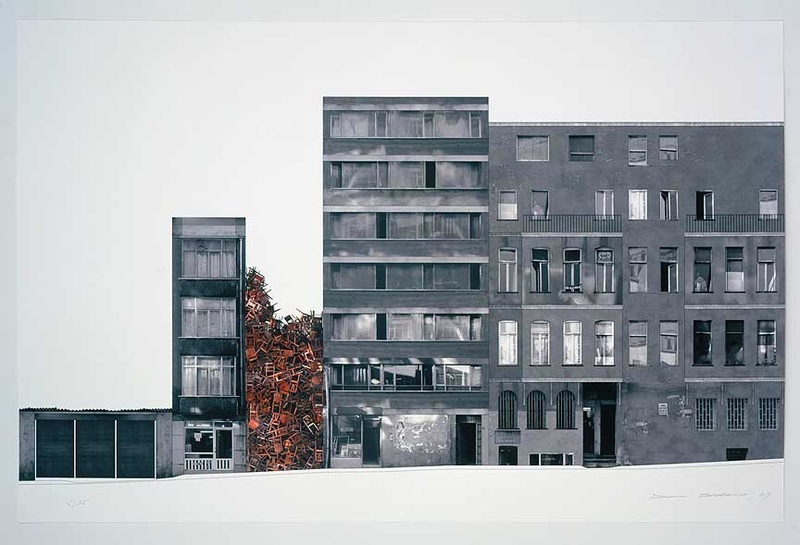 Doris Salcedo, “Istanbul Project II,” 2003. Piezo-pigment on Hahnemühle german etching paper; 24 1/2 x 37 1/4 inches. Edition of 35. The exhibition includes both photography and installation art, showcasing the preparatory images for the artwork Salcedo presented for the Istanbul Biennial in 2003, and also of the work titled Shibboleth, which was presented at the Tate Modern’s Turbine Hall in 2007. The latter consisted of a 167 meter-long fissure along the floor of the space. Also as part of this exhibition is the extraordinary work titled A flor de piel, 2014, which consists of thousands of red rose petals that have been sewn together to make a shroud which covers nearly the entire floor of a museum gallery. Each petal represents a victim of violence, which overlap to conform an offering to an anonymous universal person. The work’s title roughly translates into “surface of the skin” which in the collection of the fused petals becomes a metaphor for the feeling of being swept away by a wave of emotion. The multitude of petals represent the countless dead, due to the civil conflict and military confrontation among warring paramilitary and government factions that has been unfolding in Colombia over the last half a century. 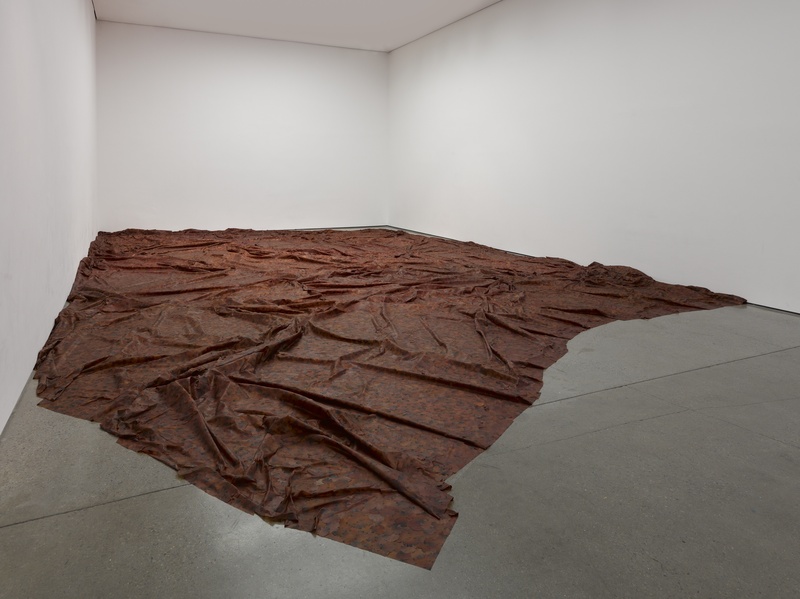 Doris Salcedo, “A flor de piel,” 2014. Rose petals and thread. Variable dimensions. Another gripping artwork by Salcedo included in this exhibition is the work titled Plegaria muda, 2011, which consists of a number of individual sculptures that are spread out across an entire floor of the museum. This artwork’s title roughly translates to “silent prayer,” and the individual sculptures are composed of a pair of tables, stacked up one over the other with a layer of soil in between them. 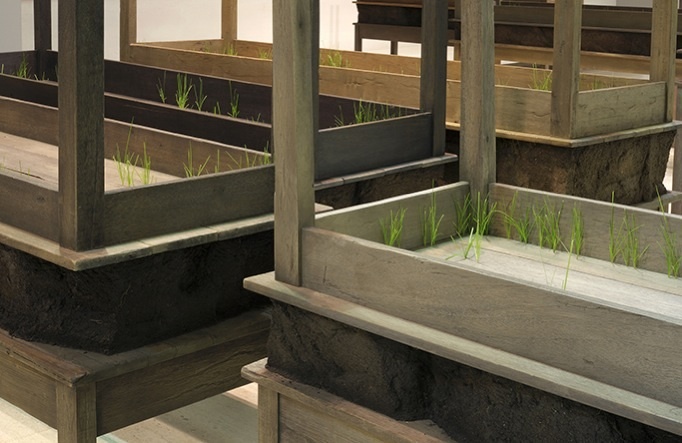 From tiny orifices delicate and thin blades of grass grow out of the table atop the soil. Each of these sculptures represents an unmarked burial, which in turn convert the museum into a conceptual graveyard, paying homage and tribute to those youths who due to the recurring violence in poor neighborhoods in Colombia have been killed for no specific reason. The growing grass blades represent the rebirth that ensues the embrace and acceptance of the pain of loss. Doris Salcedo, “Plegaria muda,” 2011. Tables, soil, grass and enclosed irrigation system. Variable dimensions. Doris Salcedo, like Teresa Margolles in Mexico, and Regina José Galindo in Guatemala, are artists that explore the social dimension of death, and the void left in the wake of senseless killing due to drug trafficking or the attempts at its suppression, as well hate crimes committed against women and indigenous ethnic groups. Their artworks are deictic gestures to the myriad sources of the violence, and how the social fabric and families are torn asunder by guerrillas, and state-sponsored exercises of force. Salcedo has since the 1990’s dedicated herself to the interviewing of the survivors of violence, and the families of those who have been killed, and based on these accounts she proceeds to produce sculptures that speak to the insanity which drives the incessant deaths experienced and endured by her people. Her artworks are not a pessimistic affirmation, but a part of the healing, and the truth-telling that needs to happen in order for us to be able to cope and rebuild ourselves and our societies, so as to not let the fire inside each one of us go out, and our hope become lost forever. For more information about this and other exhibitions at the HMoCA visit the museum website by clicking here.